Welcome to the Reading Without Walls blog tour! 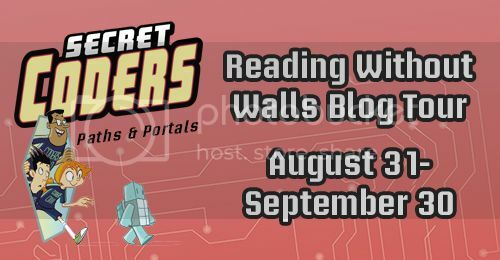 I have the honor of taking part in this awesome blog tour, where participants celebrate the publication of Gene Luen Yang’s Paths and Portals and encouraging readers—especially young ones—to read outside of their comfort zone by reading STEM books—a book dealing with Science, Technology, Engineering, or Math. It’ll educate and nurture them on a topic or issues they aren’t familiar with, thus expanding their minds. I’ll be talking about the Secret Coders series by Gene Luen Yang and Human Body Theater by Maris Wicks.